Once upon a time beds and mattresses were very different. The history of beds follows that of humans, with the first, and certainly crude mattress thought to have been invented way back in the Neolithic period. It consisted of grass, leaves and had animal skins placed on top. It remained the primary bedding for almost 4000 years B.C. And believe it or not, the next innovation was a waterbed! Developed in Persia, it was made of goatskin filled with water. Over the next 6000 years we have seen many developments, from the use of Palm boughs by the pharaohs who used them, but on a raised surface around 200 B.C. The next big innovation came from the Romans who stuffed straw, wool or reeds into cloth. Then during the Renaissance fancy velvets, brocades covered mattress fillings of feathers of dried vegetable shucks. 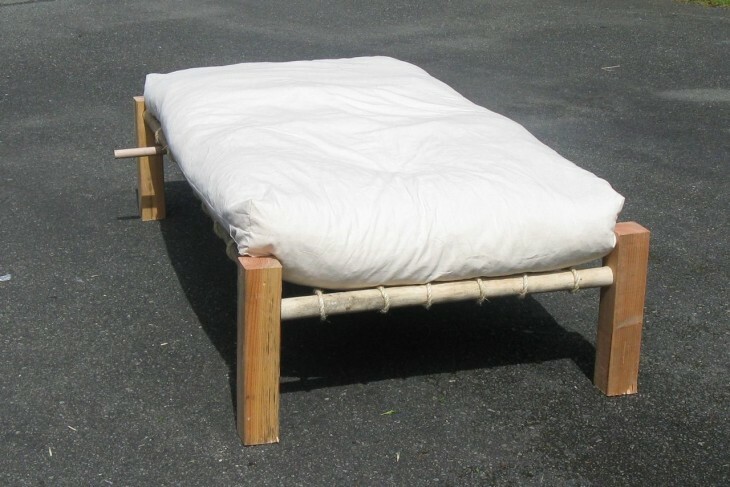 Then came the first true bed mattress stuffed with straw or down that sat on top of a timber bed frame. The first box springs were invented in the 18th century, and mattresses were now filled with coconut fiber, wool, cotton and even horsehair. Boy, I would sure have been allergic to my own bed!!! Between WWI and WWII latex foam entered the arena. In 1926 Dunlop introduced the technology to produce vulcanized rubber latex foam. Initially it was sold only to the British Royal family! In 1940 air mattresses constructed of rubber coated fabric were invented. 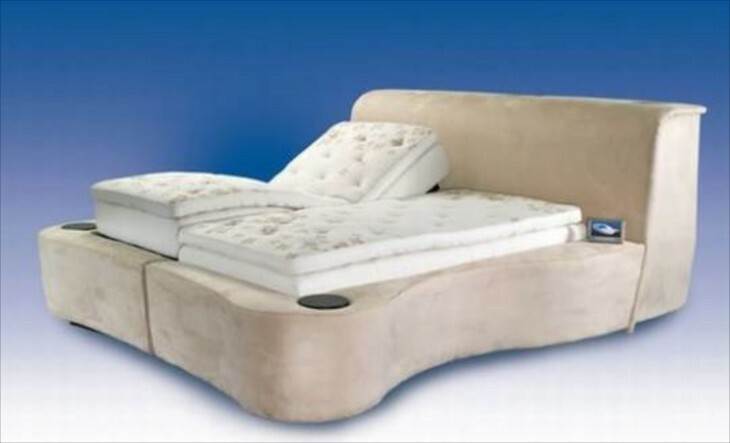 Around 1960 the modern waterbed came into popularity, and adjustable beds were introduced in the 90’s. Tempur-pedic mattresses are a result of the NASA space program when they invented memory foam. The latest big development in the history of mattresses came when manufacturers Simons developed the “no flip” mattress, which has been adopted by almost all bed makers now. Took a long time to get there, but now, with the advent of new technology, the choices are coming almost as fast as new cell phones, although with a much steeper price tag. I need a new mattress, and as I was searching for info I came across these high tech ones and thought you might find them interesting. Several have features that many of us would choose to have and for various reasons. I expect that soon these features will become standard, or at least an option when we purchase our next mattress. So lets look at what is now available. How far we have come from this! This first bed is from the Lomme Company and certainly speaks of modern design and luxury. It offers an amazing sleep experience and fuses natural therapies with cutting edge technology. It utilizes light, sound and massage therapies to create a relaxing and comfortable environment for the users. You can also hook up your iPod to the Lomme Bed. Yours for £33000 or a whole lot of US dollars. There is something sensual in the egg shaped design, offering somewhat of a cocooning experience, which by itself can be restful. Now, if you are one of those lucky folks who hits the bed, immediately falls asleep and never moves, then this mattress is for you! From the company……The Starry Night Sleep Technology Bed from Leggett & Platt is a spellbinding combination of technology and bedding that makes use of diagnostic tools to moderate temperature, monitor body movements and alleviate snoring. At $50,000, it’s not just another run-of-the-mill luxury bed. 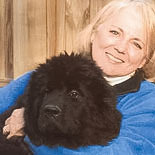 It touts anti-snore technology to reduce snoring in mild to moderate cases by elevating your upper body a few degrees. Its dual programmable temperature control from 68 to 117 degrees Fahrenheit adjusts the temperature to your liking. The Sleep Diagnostic Center monitors body movement and breathing pattern throughout the night. If you are the one who can’t live without music, the bed comes with an iPod docking station and 2500-watt surround sound system with four 8-inch subwoofers. Other salient specs include Internet connectivity, wireless RF remote that connects to a 1.5TB media server with four gigs of RAM, and a 1080p projector. 3. Hollandia Platinum-Luxe Elite sleep system. With a system like this you don’t have to get out of bed ever. 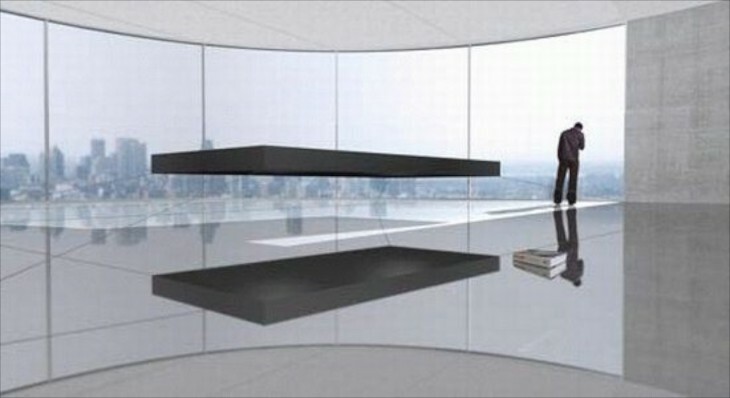 Designed by Dutch architect Janjaap Ruijssenaars, this bed levitates freely in the air, thanks to the magnets integrated into the floor and the bed. Just in case, for safety, the magnetic floating bed stays in place with the help of extremely thin steel cables. 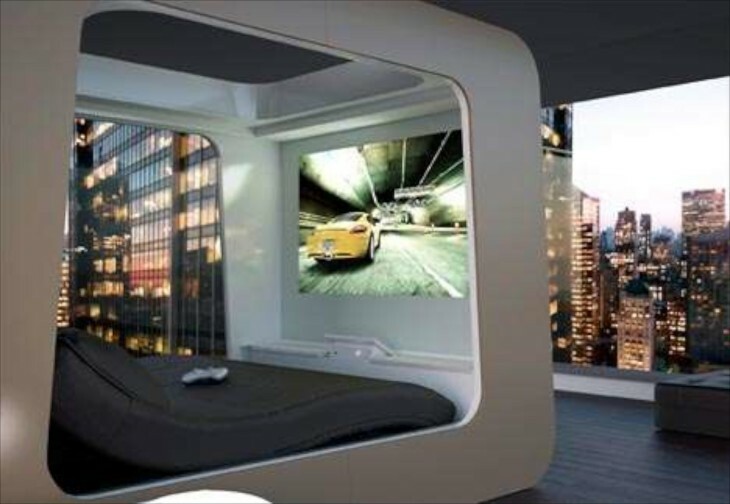 The magnetic floating bed carries a price tag of €1.2 million. Designed by Edoardo Carlino, the Hi-Can High Fidelity Canopy offers a new modern and sleek interpretation of the canopy bed. Along with superb bedding, the HiCan features a high end sound system, reading lights, integrated PC and a projector to enjoy movies on the home theater screen that slides down at the foot of the bed. You can control everything with the included home automation system. The HiCan High Fidelity Canopy Bed carries a price tag of €42,000. Here is the High Can Theater Bed from above, but with the TV screen up. Behold the big bed! 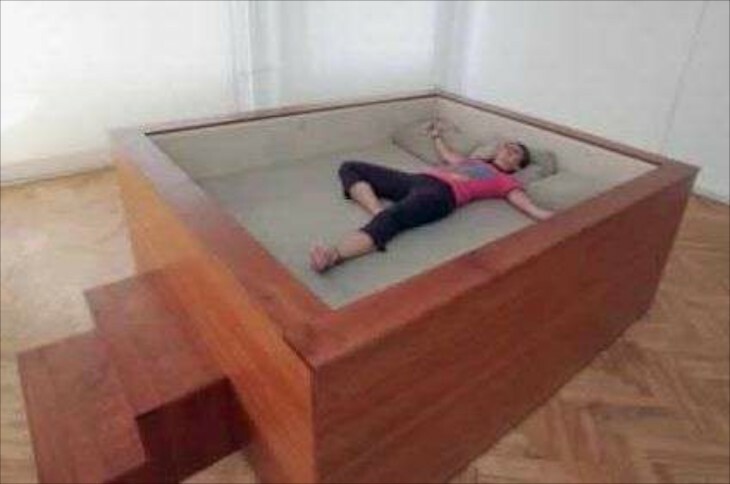 The Sonic bed is a gigantic bed with 12-channel surround sound. It may resemble a wooden tank from the outside, but it touts enough speakers inside to make a perfect home theater set up. Designed by Kaffe Matthews as a museum exhibit, the bed runs on 220 volts of electricity and covers every inch of your body in sound. There is something to be said about sound therapy. More on that below. Or, all you need to do is hook up a TV and you will have it all. Kaffe Matthews is the designer of this Sonic Bed, a bed equipped with built-in loudspeakers. The purpose is to concentrate on making music to feel rather than just listen to. When you lie down on the bed an endless loop of sounds surrounds you and allows your entire body to experience the music. Music for Bodies is a research project that links the sonic mapping of human bodies to architecture. Implications – Products that play on multiple senses provide a unique experience for consumers. It allows them to have experiences on higher levels and give them an overall great feeling. 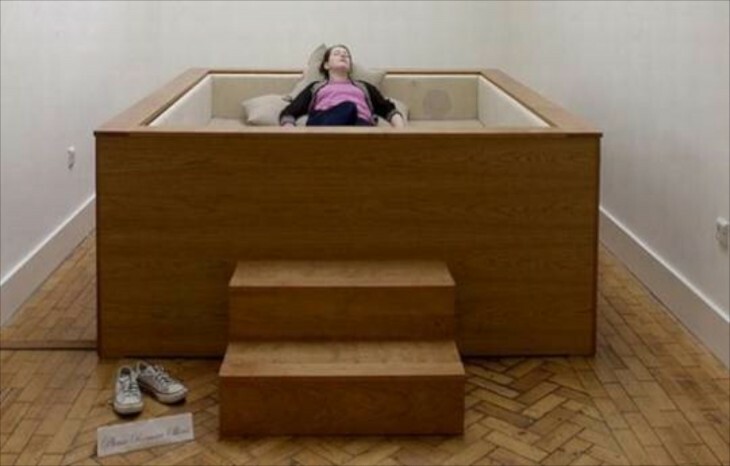 Ideas such as the Sonic Bed create a new experience for its users. I myself have experienced this and it is an amazing odd experience, incredibly relaxing. 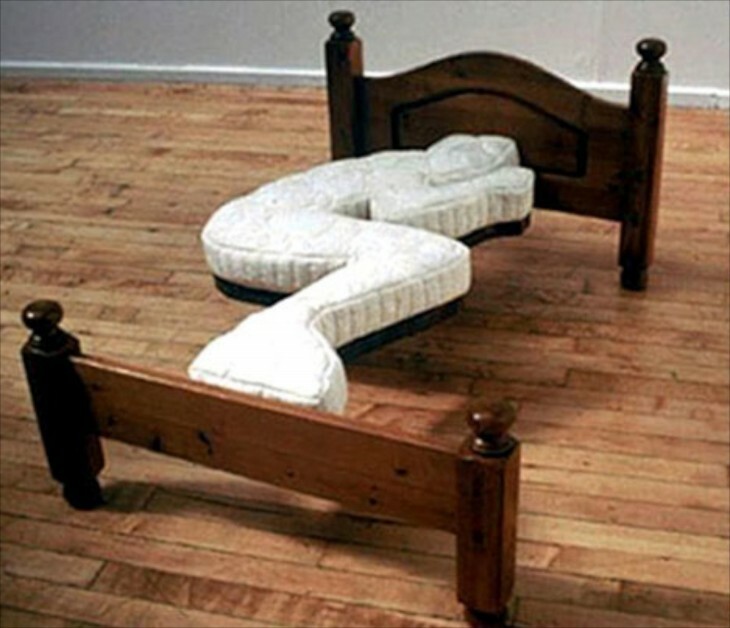 This bed is for us ladies……..it blows cool air under the covers…no more explanation needed! Another bed by Kaffe Matthews,The Quantum Sleeper Sonic Bed Unit is a high-level security system designed for maximum protection in various hostile environments. 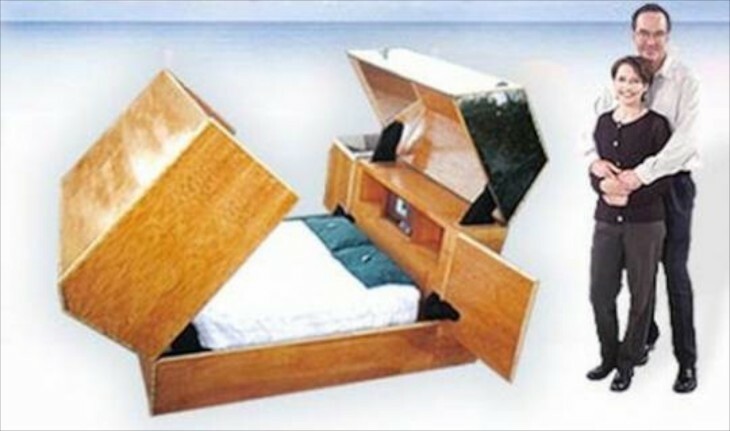 The high-tech bed folds up into a fire-resistant coffin-like box to keep you safe from any uneventful event. The bed is fitted with a high-level security system that protects you from destructive forces of nature, bio-chemical terrorist attack and kidnappers. Besides, the bed is not just about protection, it is also the ultimate in entertainment and communications as it also comes with a built-in CD player, DVD Screen with PC hookup, microwave and refrigerator along with cellular phones and radios to keep you connected to the outside world! The bed is designed to enable the person(s) inside the unit to see out and prevent those outside from seeing in. The bed, though not in production, costs an estimated $135,000. Not quite so sure I believe it can protect you like that! This is kinda cool. 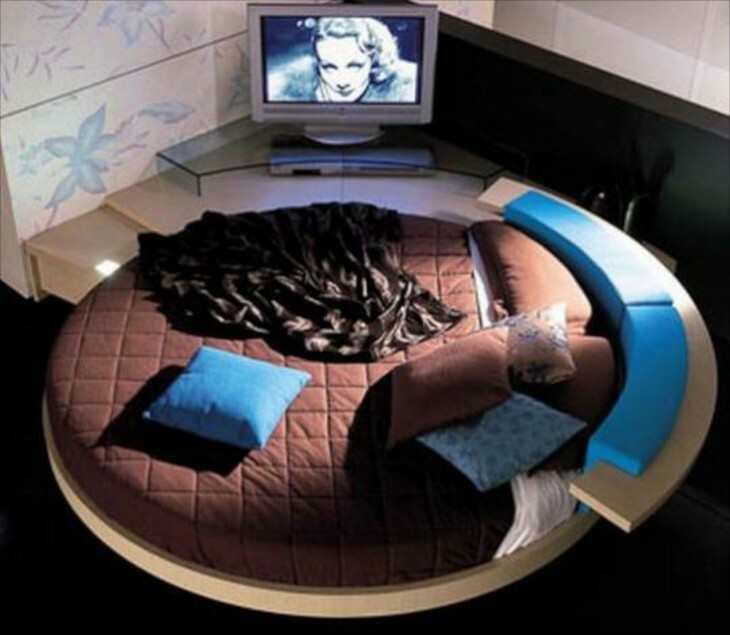 The circular bed rotates up to 360 degrees, which means you can turn to watch TV, or back some to take in the view, or rotate some more to more conveniently access a bathroom of exit door.